Sage is an old friend. I've grown it for years and know it can take some abuse. This makes it a good plant for a beginner. Common sage ((Salvia officinalis) is a sturdy perennial that will overwinter in the snow, suffer through a blustery spring, withstand 100 degree F days with good grace (if a little temporary wilting) and still come through it all looking pretty darned good. 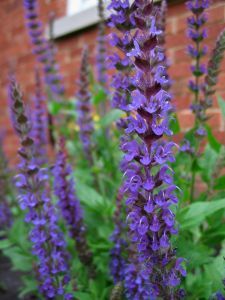 Tri-colored, yellow and purple sages are pretty to look at, and even common sage is an attractive plant when it's young -- the leaves are soft and a bit fuzzy with subtle grey-green colored leaves with a pebbly appearance. The leaves also have a nice, long taper that looks dramatic when included in a cut flower arrangement. Sage is beneficial in the garden too. It repels cabbage moths and those pesky hopping black flea beetles. It's useful in the kitchen: You probably know that it's a basic seasoning for holiday stuffing. It's also a main ingredient in most poultry seasonings. It makes a good pork rub, and it contains natural estrogens that can help control hot flashes and night sweats when brewed into tea. (One cup before bedtime and you'll be less likely to wake up on a moist sponge instead of your trusty mattress.) If you're one of those women who can feel a hot flash coming a few minutes before it hits, having a cup of sage tea may stop it cold (pun intended). There are also sages like the Russian varieties (Perovskia atriplicifolia), that are low maintenance landscape staples for difficult locations (honeybees love it). Older culinary sage plants get woody and start to disintegrate from the center outward. After about three years, replace plants to keep them looking tidy. Sage likes full sun and can't tolerate boggy soil for long. Many sages grow tall, up to a couple of feet, so keep them well back from shorter plants. Sage can also get unruly. The stems look sturdy and thick, but it doesn't take much to knock them over, and they take umbrage at the assault and just lie there. If you have sage in a windy or vulnerable location, be prepared to stake it. If you have a pineapple sage (which isn't winter hardy), you can overwinter it indoors. You'll need: a sunny window (6 hours of sunlight a day) or be willing to supplement your available light with a grow light. Sage is most popularly used with fowl or pork: turkey, chicken, goose, pork sausage. You can find prepared sage either ground or in a fluffy rubbed variety. Once harvested, fresh sage will last up to four days, but you can extend is life by freezing individual leaves or immersing them in olive oil and refrigerating them. I like the oil route because the leftover oil will take on a sagey flavor you can use sparingly in salad dressings and egg dishes. To optimize the flavor, add sage during the last half hour of cooking when making long simmering dishes like soups or stews (or anything in a crockpot). The ratio of fresh to dried sage is roughly three to one: Three teaspoons of fresh sage (about 12 leaves) to one teaspoon of dried sage called for in your recipes. When using sage in combination with other herbs, it plays well with: thyme, rosemary, marjoram, oregano, fennel, cilantro, paprika, parsley, bay leaf and garlic. I love sages. One of my favorites is a dwarf which I obtained from Richters several years ago. It has a very neat habit, small leaves and beautiful blue flowers....but, the plants never seem to survive more than two years in my climate here in Arkansas. By rooting cuttings during late winter/early spring in the greenhouse, I have managed to keep a few plants in my herb beds. The year old plants in my garden now are in full bloom and are beginning to show signs of dying. The stems on the outside of the clump begin withering and that process continues over a period of weeks until the entire clump has died. Take a cutting with healthy looking foliage from this "dying" clump, root it and it will grow into a healthy looking plant for the current year, overwinter, bloom in the second year and then die. So strange. Anyone have experience with this dwarf? Direct sown large leafed sage will often live for 4 or five years, though it gets pretty lax, woody and unattractive. I would really like to know the size that each type of herb grows!